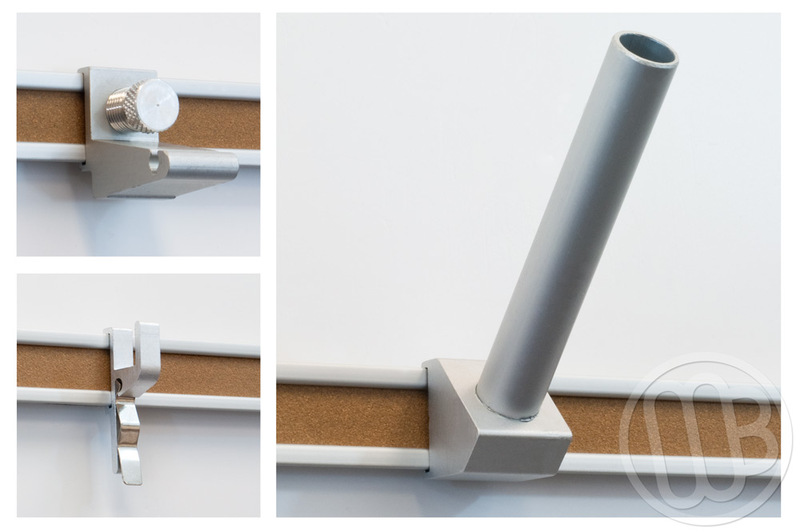 1" wide map and display rail can be ordered with a variety of accessories made exclusively to fit onto the molded aluminum trim. There is a lip at the top and bottom of the molded map rail trim. Each of the accessories slides over the lip to stay securely in place. Select a Flag Holder that holds a standard classroom American Flag. Each sold separately. There is also a set of Map Winders that work like a window shade holder for retractable maps. Sold as a set, one left and one right side. End Plates are used to finish off your map rail by closing the ends and holding the cork insert from slipping left or right. Sold as a set of 6 units. Finally are the 1" Clip Hook combination units. 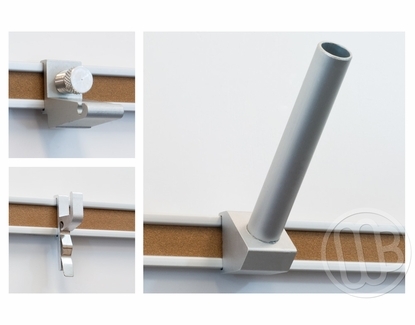 This is a unique accessory that you can use either as a hook or there are aluminum clips on each to hold or display other items. Pictured above. Sold as a set of 4.